The Bissell Crosswave comes with lots to talk about. If you're looking for a cleaning tool to scrub both area rugs and hard floors, you might really enjoy using one of these. The 2 tank system allows you to clearly differentiate between solutions. The dual action brushroll allows you to vacuum and mop at the same time, while the usability is greatly enhanced by the ergonomically placed fingertip controls and the swivel steering. Overall, a great unit with minor drawbacks. As I was saying, Bissell Crosswave vacuums and scrubs at the same time. Usually when assessing the cleaning power of a vacuum cleaner, there are 2 things to consider – suction and agitation. The Crosswave however is not only a vacuum cleaner, as it uses a cleaning solution in the cycle, so it’s more closely related to carpet cleaners. That is why I am not rating only the suction here. By the way, the last carpet cleaner from Bissell was the Revolution model, a great lightweight unit. If you have wall to wall carpets, I recommend getting this instead. Now back to our review, I would say that the suction power of the Crosswave is around 100-150 AWs. As for the agitation, the Dual-Action brushroll (which works on both hard floors and area rugs) spins at 3,000 rpm. This provides enough cleaning power to help you tackle virtually any type of floor, from hardwood up to low pile carpet. It pulls about 4.4 amps of power when running, so energy wise, this is a very efficient and effective product for normal day-to-day or week-to-week usage. It has a two-tank cleaning system, one for dirty water (which holds about 14.5 ounces of liquid) with an automatic stopping mechanism in place for avoiding the overflow of dirty water back onto your clean floors, and one for clean water and solution, which holds about 28 ounces of liquid. The dual tank system assures that the clean and dirty water never get mixed together and therefore adds a level of cleaning stability. Unfortunately, with a full tank, you can only cover about 700 sq ft., so you will need to refill from time to time, if you plan on using the Crosswave over larger areas. The clean water tank has no level indicator, so you need to check it out from time to time. The filter assembly pictured in the right image is retaining most airborne particles outputted by the unit. This is a washable part, but make sure it is completely dry before inserting it back into the unit. The filtration is not HEPA grade, but I wouldn’t expect having this kind of filtration from an all-in-one machine in the first place. If the filter gets worn out, it can be replaced for less than $10, directly from the manufacturer’s website. At a mere 11 pounds, 46 inches tall, and a little over 11 inches wide, it is small enough to fit in a corner or closet. It also comes with a tray that you can place under the unit. This will protect your floor from being damaged by the constant storage in the same spot. In fact, I recommend that you remove the brushroll before storage and place it in the specially designed brushroll tray. It is a self-standing device, so there’s no need to find something to lean it against. There aren’t too many accessories to talk about. The easy storage system consists of a nozzle tray and a brush roll attached tray. Other than this, the user manual and the quick start guide, all the components from the package are meant to be assembled into the main unit. Depending on which model you buy, the package may also contain one of the cleaning formulas described below (small bottles, 8 oz). The swivel head makes it easy to reach into tighter spaces. It lays down at a very low angle, allowing you to grab the obsolete dust bunnies hiding under your furniture. It swivels around so that when you move into corners or around other objects, you can do so with ease and without the bulkiness, discomfort, and awkwardness of a usual vacuum or carpet cleaner. The controls are easy to access. Fingertip buttons are strategically placed on the handle in such a way that you don’t actually have to think about which buttons you are pushing for whatever effect you are trying to achieve. Whenever you want to apply more solution, all you need to do is to push the button inside, which also lightens up the LED on the nozzle. Unfortunately, the LED doesn’t stay on, and only lightens when more cleaning solution is added. The easy transition from hard floors to rugs is one of the main reasons why I like this product. Bissell continues its line of innovative and useful products. Instead of using the traditional cleaning methods (a normal vacuum and a mop) you can now get the Bissell Crosswave and have all the functionalities in a single device. It does not have a water filtration system nor does it have a built-in water heating system. For an effective and deep clean, you are instructed in the owner’s manual to mix warm water with the solution that is included or which can be bought separately. Don’t worry, I will cover the cleaning solutions in dept in the next section. The cord is about 25 feet long. Moving from room to room is easy, and you save time by not having to stop and unplug just to re-plug in another outlet in another room. The length would do, but unfortunately, it is not retractable and may get under the machine from time to time. It is also very easy to assemble: just a few click-into-place pieces and you are ready to use your new product. It makes a high pitch sound when the dirty tank has reached its full capacity. Then you just simply unhook the dirty tank and dump it out to finish the job you are currently doing. Speaking of sounds, the unit operates under 62 db. It leaves no residue from the cleaning solution and dries quickly so you can avoid any slips or falls or worse, any damp carpets. It is ideal for high traffic areas. The only drawback I see is that it takes some time to spray the solution and go back over it. However, watching the dirt and nastiness being sucked up into the tank is liberating. One more thing you may find uncomfortable: once you snip the handle on, you can’t detach it back. Usually comes with a 2-year limited warranty; it is a Bissell product so it is very reputable, as Bissell is one of the top manufacturers of home cleaning equipment. If you buy it directly from BissellCrosswave.com, you get an additional 2-year extension, summing up to 4 years of warranty, which is a lot for a product such as this. The price of this unit is about $250. Occasionally, you may snap some discounts. At the moment, you can get a good deal on the Crosswave here. Other places from where you can buy it include the producer’s main site and the official page of the product, BissellCrosswave.com. Tank Capacity 28 oz 32 oz. 13.5 oz. Weight 11 lbs. 16 lbs. 10 lbs. Cord Length 25 ft. 27 ft. 25 ft.
What do you think about the Bissell Crosswave 1785 series? Would you say it is revolutionary piece of home cleaning equipment? I am looking forward to reading your comments! I bought the Crosswave after much deliberation but knowing that Bissell has quality products. I can only say I wish I would’ve ordered it sooner! I recently had a couple vertebrae fused and I’m supposed to take it easy which is hard to do with 20+ cats in the house and a husband who doesn’t help out with housecleaning. I work full-time and have a two-story house to maintain self I am always trying to find time in my schedule to get things done on this machine has helped me greatly. I simply love it and I don’t say that lightly. I can be very critical when things don’t work, which happens a lot, but not here. This machine is the best ever. It vacuums up kitty litter, cat food, and it doesn’t shoot it back if you like the majority of the vacuums do today. 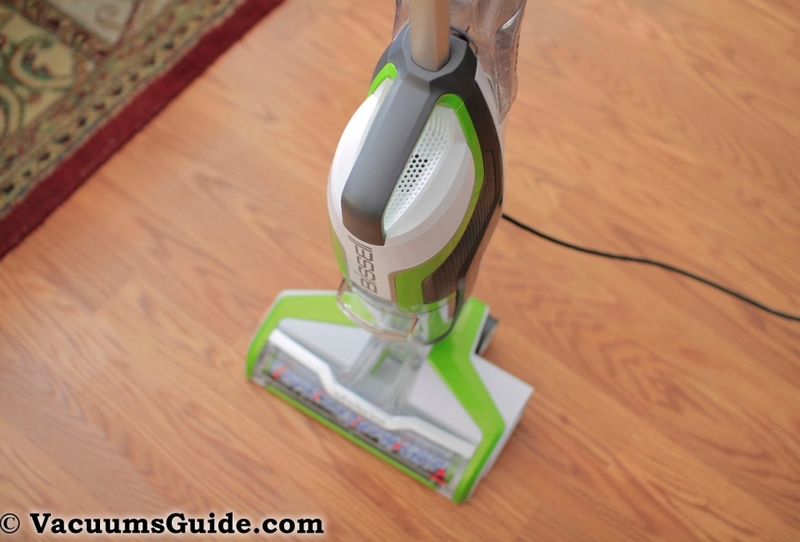 It has been such a timesaver and gets my house even cleaner than before. I love it so much I pull it out during the week on a regular basis just to clean up because it’s so easy. And when those cat hairballs come up, the Crosswave wavve just takes care of them whether hard floor or area rug And when I get new kittens to foster that aren’t quite litter trained out comes the Crosswave. I simply love in this machine and cannot do without. If you’re even just thinking a little bit about it do it. Purchase this machine and you will be so glad you did. I’ve seen reviews where it’s loud and yes it is a bit loud but it is a huge timesaver and really get your home clean ! I have always said that vacuums must be invented by men because they’re just so many things wrong with them but you can tell a woman had input on this one, if not complete input. My only wish is a retractable cord. Everyone loves the long cords but I get tired of tripping over them. In summary go buy this now and you will be so happy. I promise that!